Reciprocal gifting relationships are what Heathens seek to develop between each class of being they interact with. We build these relationships with the wights, being classified as all things having spirit includes all living people, animals, plants, the spirits of rivers, lakes and streams, of field, forest and home. 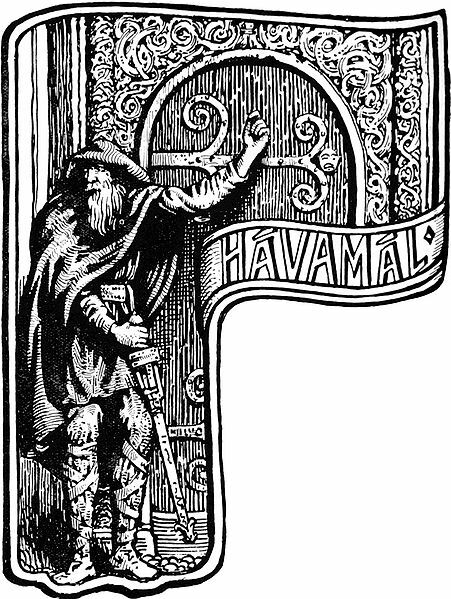 The laws of hospitality in the Havamal guide us in building these relationships between people, but apply as well to the other wights, the animals and plants that surround us, and that we not only share our land with, but depend upon. This building of relationships through exchange of gifts becomes the centerpiece of practice for spiritual matters as well. We offer to the wights of the lands we are in, we offer to the ancestors that came before us, and to the Disir, the female ancestral spirits whom tradition has guide and guard our lines still. We offer to powerful and self-aware spirits of the lands around us, the alfar, the Jotun. Some we seek to build relationships with, some we seek merely to placate because their nature is not friendly to our presence. The volcano will not be your friend; it might perhaps not kill you today. A question that drives most new heathens nuts is “who is a god?” Well that is a funny one. In heathenry, godhood is relationship based. Jotun or giants are classified as powerful self-aware discrete knowable entities of tremendous power, embodying powerful natural forces. Gods are those with whom we have built reciprocal gifting relationships. Our gods are of the tribes of the Aesir and Vanir. Most are at least half Jotun by blood, some completely so. What makes them Aesir and Vanir is the honouring of those bonds, the acceptance of duty. It is the reciprocal gifting relationship that makes Skadi a goddess, even though she was a Frost Giant until demanding her suffering price. Sif, Gerd, and most of the goddesses are in fact Jotuns won in marriage from those tribes. Their marriage vows made them Aesir and Vanir, and brought with them ties to us. Who is a god then depends on who is honoured by local practice. To the Angles and Saxons, Easter was a goddess, and Volund or Wayland the Smith was a god. To other tribes, they were simply Alfar or elves, beings of power but not owed any reverence. To farmers on the plains of south Germany, Njord of the sea is of little importance. To a people of the sea, whose soil is of little worth, and whose position between warring tribes hangs ever by the edge of a knife, Frey the Peace-Good, lord of the renewing earth is not the most important god; rather Odin the Victory Father, Thor who calls the storm and fends off the Jotun who bring the fogs and sea locking ice, are most important, and Njord of the sea will know more offerings than Uller or Skadi the hunters patrons. Why we offer is a question that each model sees through the lenses of its own central Obedience models understand that God is owed worship because god is great. He doesn’t actually have to earn his keep, you are assumed to be in his debt simply by existing, it is the fundamental assumption that worship is owed. Mystery models approach worship as craft. To those who follow the assumption that worship is magic, each act is specifically crafted to a purpose. Some are giving thanks, but even at such celebrations, the focus is on raising energy, and doing something with it. Magic is the focus, and the sacral season provides the form that magic will take. For such models, the god or goddess invoked is often the one seen to govern that aspect that the magic is expected to change. Frequently mystery models will treat gods or goddesses as archetypes, sort of a soft polytheism where gods are (to one degree or another) interchangeable. For this reason the specific god or goddess invoked will be entirely appropriate to the task at hand, or sacral season. Relationship based heathenry operates somewhat differently. Like the mystery model we use prayer to ask for things, unlike that model, we don’t always pick what people would consider the “right god for the job”. The concept of Luck Holder, or god or goddess that holds highest place with a tribe or group is important. The ancient concept of cult is an expression of this. Sparta did not hold Artemis was higher than Zeus among Olympians, but they did hold that she was goddess of Lacedaemon, of Sparta. That she held them first and they held her first. In this way the Heathen Freehold has upon its banner, Odin’s steed Sleipnir, as sign that he is our luck holder, even as the Troth has upon its sign Idunna’s apples, as their magazine bears her name. While a given god or goddess may be seen to represent that archetype best suited to a given task, when you make an offering in hopes of receiving a blessing or help towards a specific outcome, what is most important to you is that the one you are offering to has reason to look upon your offerings with favour, to look upon your needs as important. It is assumed that all gods have the power to affect the world, as do the Disir. What is the critical element then is why should they care to? Building that reciprocal gifting relationship is the keystone of heathen practice, building up a mutual respect and interest in each other’s welfare. For this reason heathens are quietly active in environmental protection, because the health of our wights affects our own. Heathens are concerned with honouring our ancestors, because through honouring our ancestors we better understand our role in properly guiding, providing for, and protecting our descendants. Each relationship provides a real and direct benefit to our daily lives and decision making. From the gods themselves we are told that we must look after our duties to those who we owe protection first. Those who depend on us, our dependants, our family, friends, and neighbors must be looked after before the gods. Our duty to the gods is paid by service to the folk. Through our community building, through the building of relationships we improve our ability to thrive as a family, as a community, as a nation, and as a people. We do not honour the gods by giving to them what they gave to us to help us succeed. If we have enough, then we offer to them in return, but if someone must go without, we do not honour the gods with offered food and hungry child. The Jews speak of bread and Torah, that Torah is more important than bread. This is the Obedience model, god gets paid first, people last. The Norse speak of looking after the people first, that it is better to offer to the gods nothing, than too much. Honouring your relationships is honouring your gods. Your duty to your ancestors is paid in care for your descendants. Very much Heathenry is about paying it forward. In the end, Heathen ethics and practice are about the relationships you build in this life. How you will affect this world, and how you will be remembered is based on how you honour those relationships.